They start singing about an hour after dark, calling with short bursts of high-pitched sound. Each call is somewhat like a can of dried peas being shaken rapidly. In the following recording, the lesser-angle wings call five times. You’ll also hear the common true katydid singing “di-di-did” in the background. Crickets are also singing in this clip — they form a continuous band of sound against which the katydids play. Lesser angle-wing katydid, Microcentrum retinerve. This individual flew into the kitchen and posed briefly on the wall. 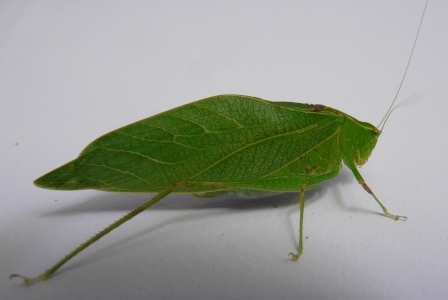 For comprehensive identification information on America’s many katydids (including sound files) see Walker and Moore’s excellent online guide. This entry was posted in Bioacoustic revelry, Insects on August 28, 2011 by David George Haskell.